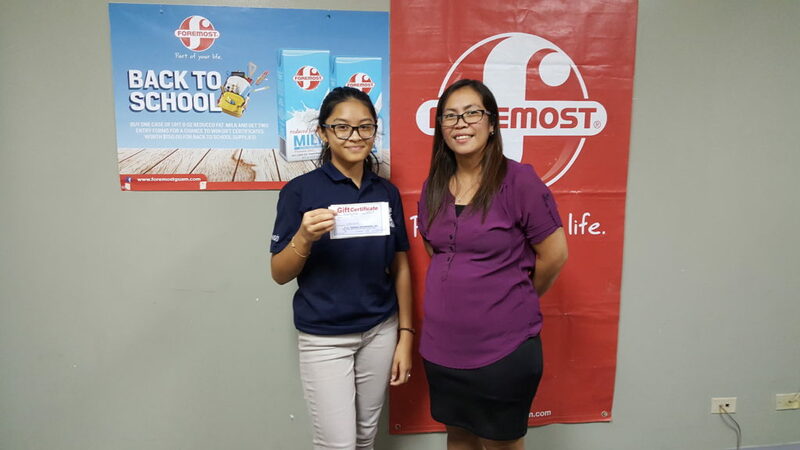 Foremost Foods, Inc. (FFI) received a certificate of appreciation from the Guam Dept. 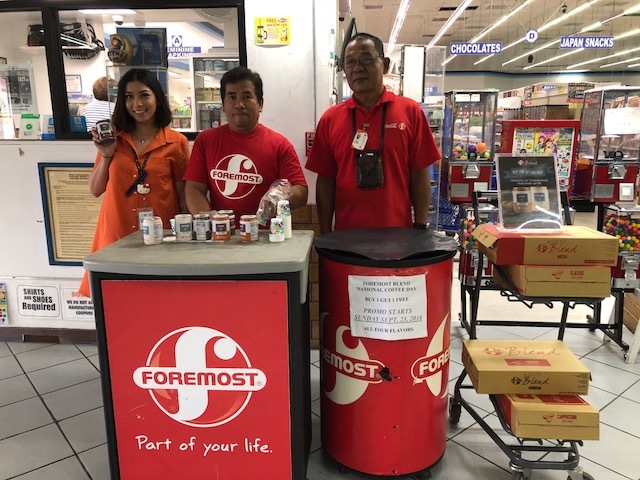 of Revenue & Taxation for choosing to celebrate National Random Acts of Kindness Day by serving free Foremost Blend Iced Coffee to customers and staff of the department. Mike Brown (right), regional sales director, FFI received the certificate from Dafne Shimizu (left), director and Paul J. Pablo (back), deputy tax commissioner, both of the Dept. of Revenue & Taxation. They are joined by Foremost merchandisers (from second left) Robby Yamasta, Sole Alvarez, and Iesha Castro. 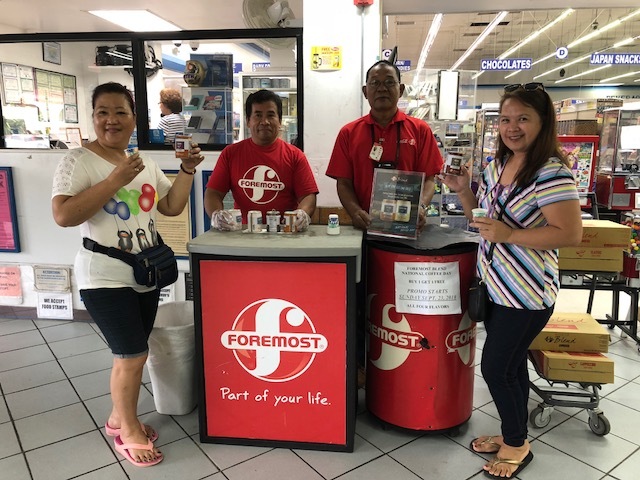 (BARRIGADA HEIGHTS, Guam)—In celebration of National Random Acts of Kindness Day, Foremost Foods, Inc. (FFI) passed out free Foremost Blend Iced Coffee to customers and staff of the Guam Dept. of Revenue & Taxation. Although the event is traditionally held on Feb. 17th, Foremost wanted to serve as many taxpayers as possible and coordinated with Revenue & Taxation to celebrate on the busiest day of the month instead. The busiest day in February at the department was on the 20th when filing for both business gross receipts and real property taxes were due. 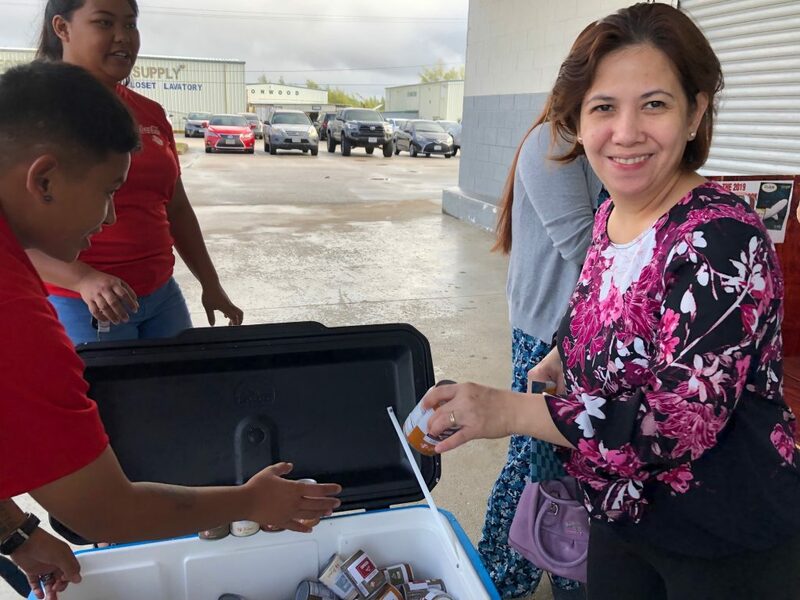 Close to 200 members of the community enjoyed the complimentary Foremost Blend Iced Coffee offered in four flavors – classic, cappuccino, mocha, and espresso. The Dept. 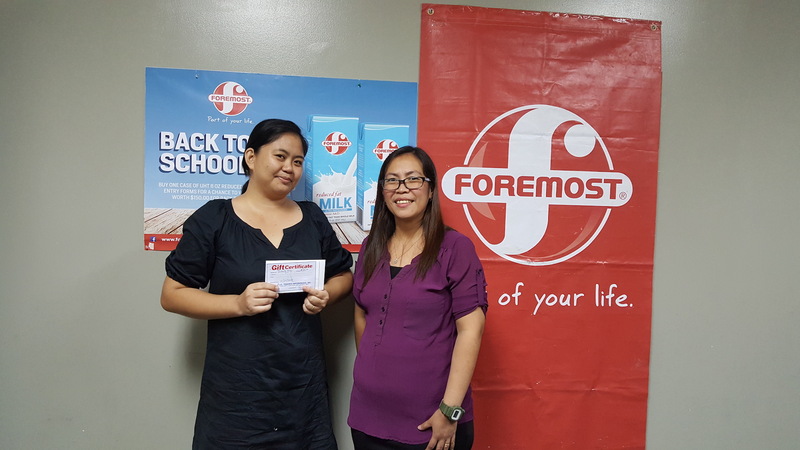 of Revenue and Taxation, headed by Director Dafne Shimizu and Deputy Tax Commissioner presented a certificate of appreciation to Foremost Foods and an individual one to FFI Regional Sales Director Mike Brown for choosing the department to be the recipient of the random act of kindness. Smiles and good cheer from a refreshing random act of kindness. Priceless. Saipan celebrates with customers free Blend sampling at Joeten Susupe. 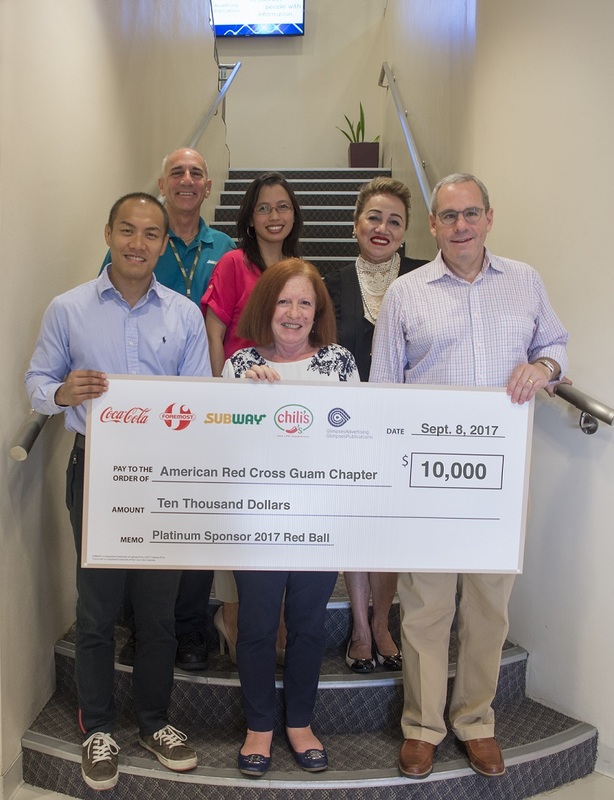 The group of companies comprising Coca-Cola, Foremost, Subway, Chili’s, and Glimpses of Guam donated $10,000 to the American Red Cross Guam Chapter for the signature fundraiser, ARC Red Ball, which has chosen for its 2018 iteration the theme, “ARC Angels”. 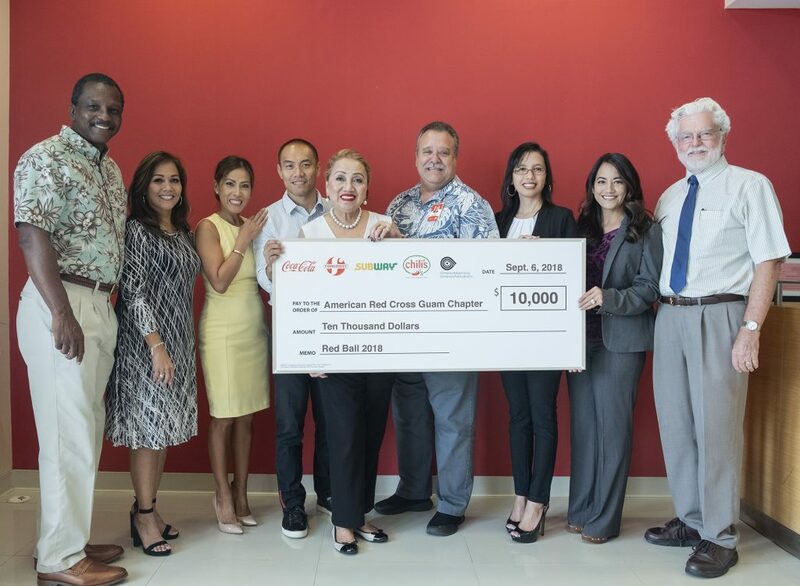 Group Executive Vice President Marcos W. Fong (fourth from left), who also serves as chairman of the board of the American Red Cross Guam Chapter, leads the check presentation together with Sharleen Marchesseault (third from right), director of marketing strategy, Glimpses Advertising; and Mike Brown (fourth from right), director of sales, Coca-Cola Beverage Co. (Guam), Inc. and Foremost Foods, Inc. American Red Cross Guam Chapter CEO Chita A. Blaise (center) together with the Red Cross board of directors, from left, Karvin Flynn, Caroline Sablan, Anna Gera-Van Seters, Monica Duenas, and Jeff Cook accept the donation on behalf of the organization. (BARRIGADA, Guam)—The group of companies comprising Coca-Cola Beverage Co. (Guam), Inc., Foremost Foods, Inc., Subway Restaurants of Guam, Chili’s Grill & Bar, Glimpses Advertising, and Glimpses Publications donated $10,000 to the American Red Cross Guam Chapter at the group corporate headquarters Sept. 6. 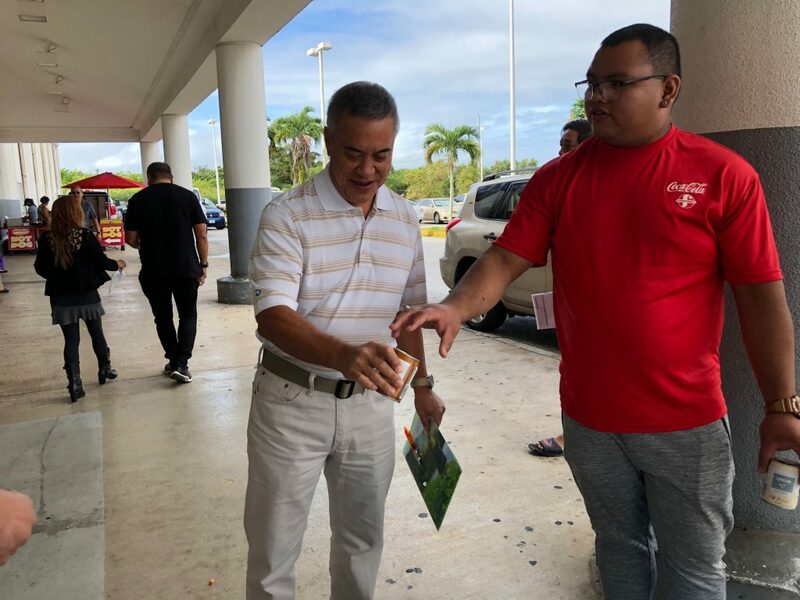 Group Executive Vice President Marcos W. Fong, who also serves as chairman of the board of the American Red Cross, led the check presentation to the ARC Guam Chapter. “We are proud to carry on a legacy of caring for our people and our island communities. Giving back is deeply entrenched in our corporate ethos. 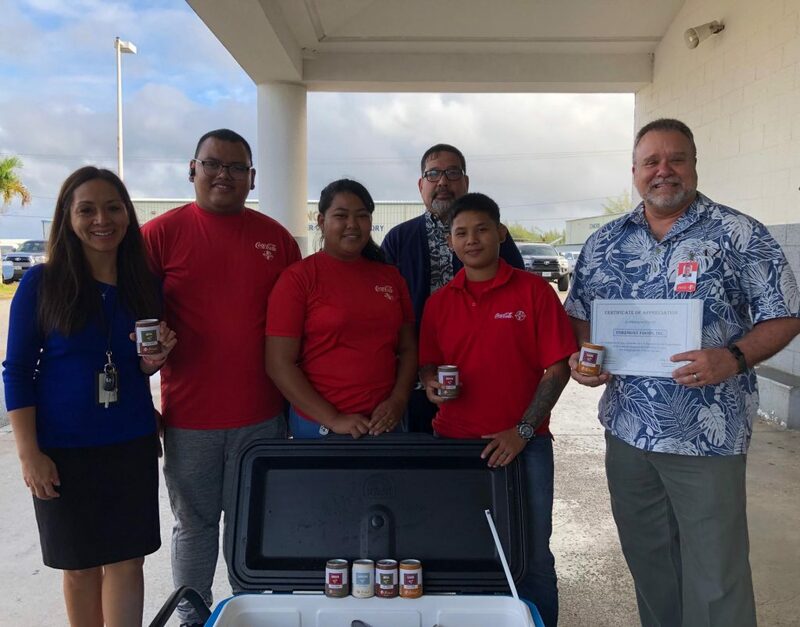 We believe in supporting the organization that teaches emergency preparedness and provides relief to the community in times of adversity,” Mr. Fong said. Chita A. Blaise, CEO of the ARC Guam Chapter, together with ARC board members accepted the check on behalf of the organization. Each got $150.00 Joeten Gift Certificate for Back to School Supplies. 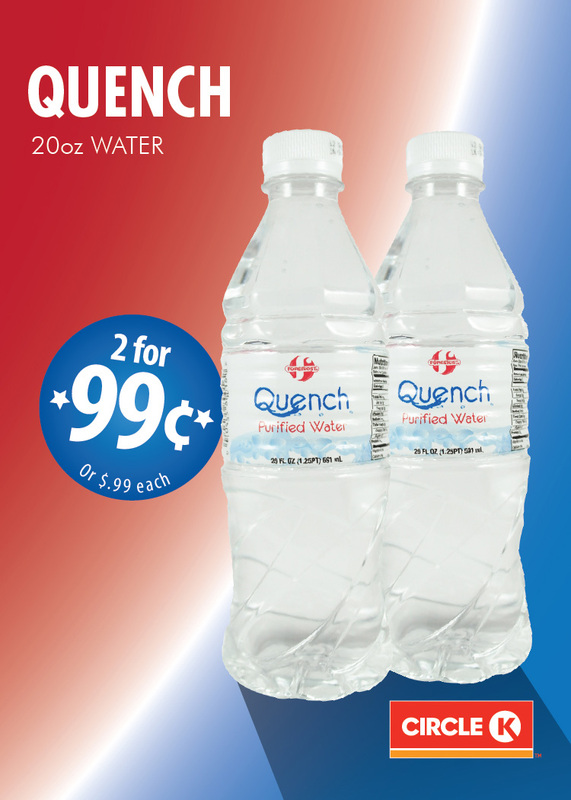 Grab some Foremost Quench water 2 for 99 cents at all 76/Circle K Guam locations from now through August. Foremost awarded $100 Pay-Less Supermarkets Gift Certificates to Fernando G. Villanueva and Yolanda S. Aquino for winning the Foremost Blend Raffle Promo held exclusively at all Pay-Less Supermarket locations. 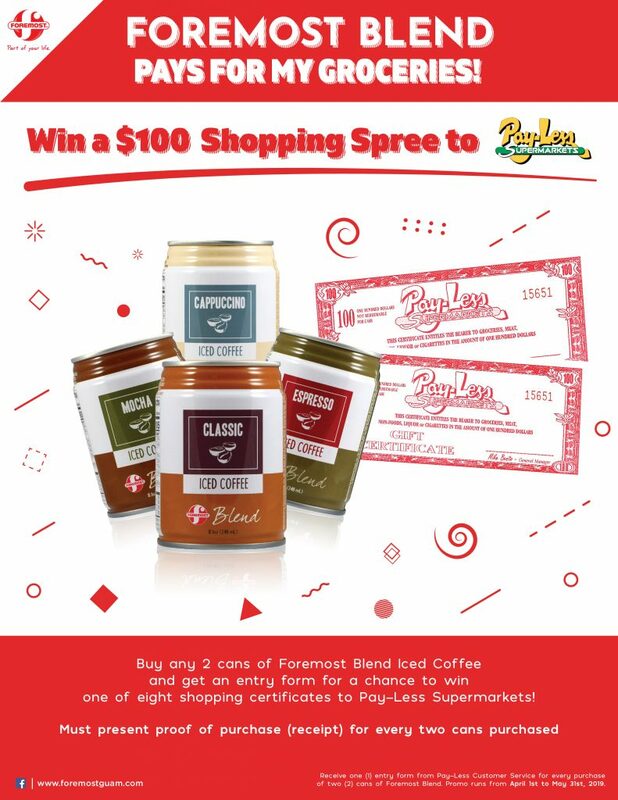 Every purchase of two cans of Foremost Blend Iced Coffee received an entry form for a chance to win three $100 Pay-Less Supermarkets Gift Certificates. 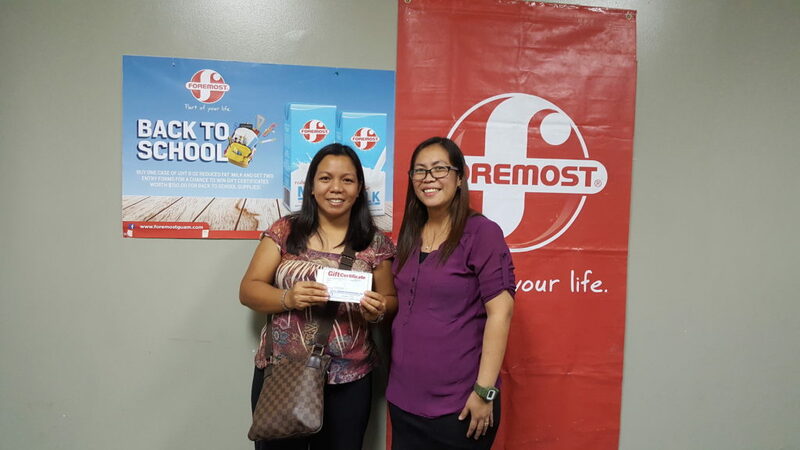 The awarding was held at Pay-Less Supermarket at Agana Shopping Center on April 4. 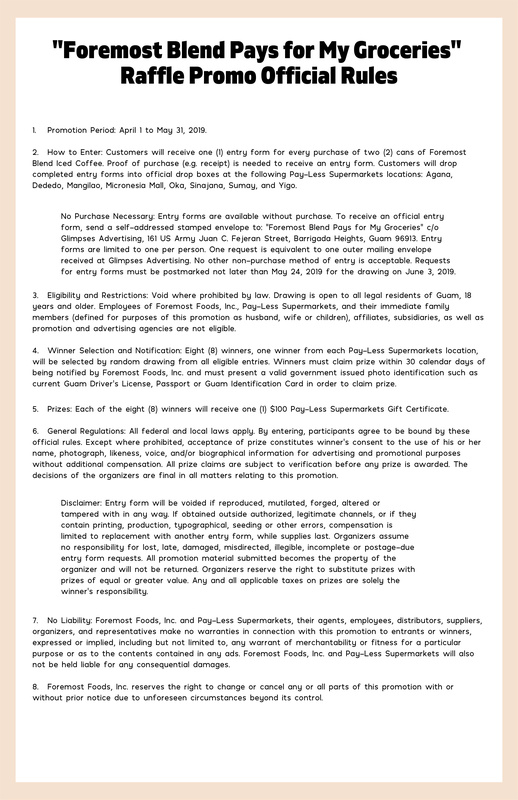 A LUCKY BLEND, Foremost Foods, Inc. Asst. 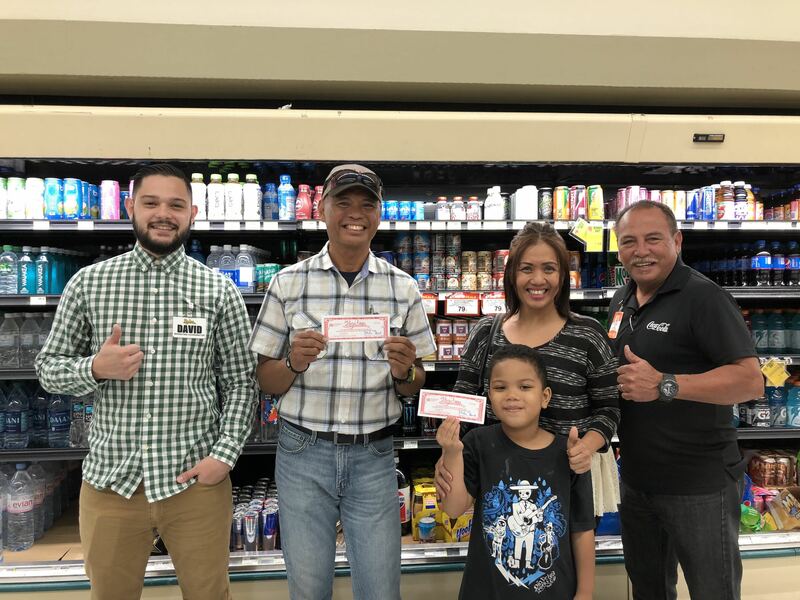 Sales Manager Joe Fernandez, right, and Pay-Less Markets Marketing Coordinator, David Disbrow, left, present the $100 Pay-Less Supermarket Gift Certificates to Foremost Blend Raffle Promo winners Fernando G. Villanueva (second left) and Yolanda S. Aquino who is joined by her son Keith at the prize presentation held at Pay-Less Agana, April 4. (BARRIGADA, Guam)—The leading food, beverage, and communications group of companies composed of Coca-Cola Beverage Co. (Guam), Inc., Foremost Foods, Inc., Subway Restaurants of Guam, Chili’s Grill & Bar, Glimpses Advertising, and Glimpses Publications has renewed its commitment to support the American Red Cross Guam Chapter, with a check for $10,000.00 donated to the organization on Sept. 8. 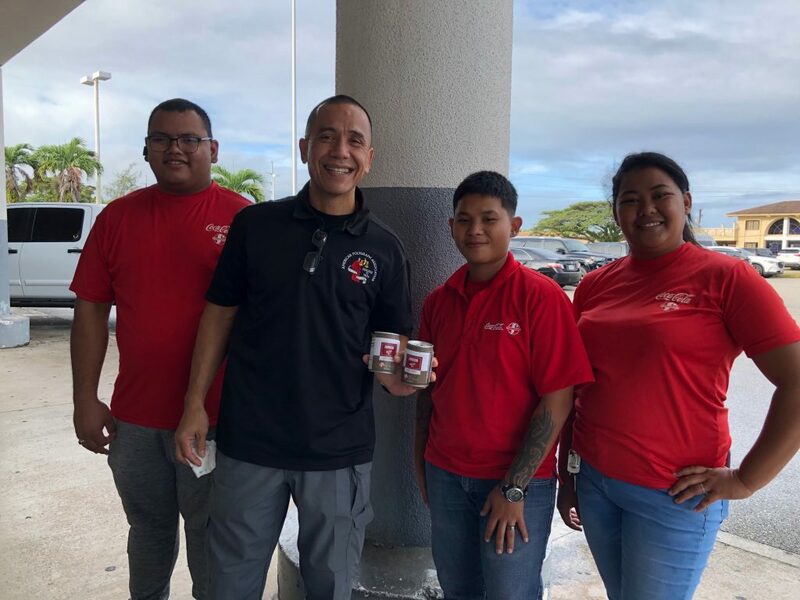 The donation will go toward the sponsorship of the Red Ball, a signature fundraiser for the organization to help the Guam community with emergency and disaster and preparedness. The 17th Red Ball, scheduled for Sept. 23 this year counts the group of companies as a long-standing Platinum Sponsor. Marcos W. Fong, group executive vice president, led the check presentation to the American Red Cross Guam Chapter, where he also serves as chairman of the board. “Our group of companies has a long history of supporting the American Red Cross. We are proud to sustain our commitment with our monetary giving to the Red Cross, as this will help fund efforts to assist our community in time of need,” Fong said. Jonathan Kriegel, president and CEO, Docomo Pacific and chair of this year’s Red Ball, and Chita Blaise, CEO of the American Red Cross Guam Chapter received the check on behalf of the organization. 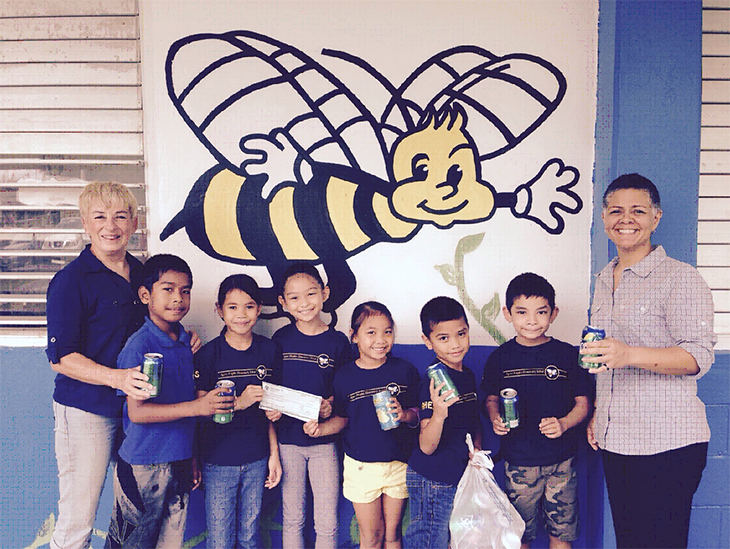 January 2016, Guam – The Guam Business Partners for Recycling, under the project i*recycle, has disbursed over $225,000.00 to participating schools for their aluminum can recycling efforts. “Our students continue to work hard to set the example for protecting our island home. But more can be done at work, home and within our villages” says Mark J. Sablan of South Pacific Petroleum and President for The Guam Business Partners for Recycling Board. The i*recycle program continues to educate the community on the importance of recycling aluminum cans throughout the island. 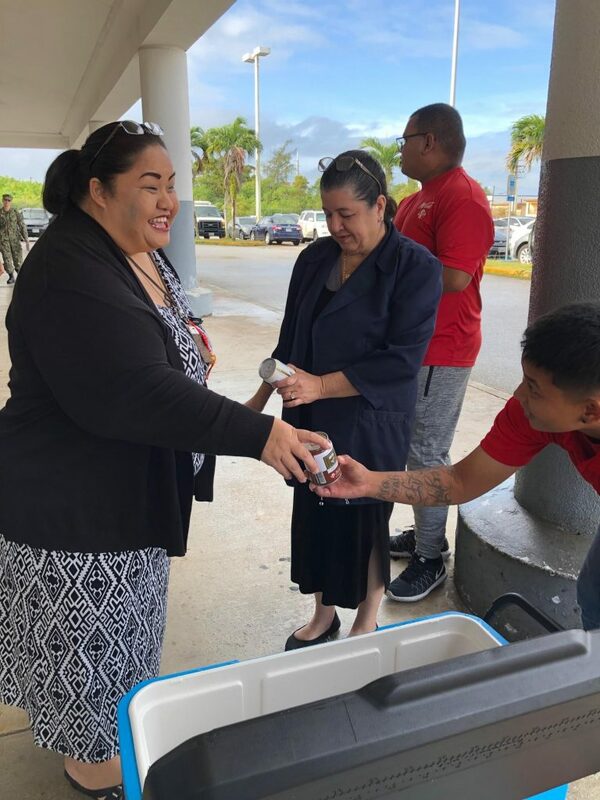 With more than forty satellite aluminum recycling bins stationed at public, private and DODEA schools, i*recycle efforts are also seen at many of our island-wide events. Peggy Denney, Program Administrator, organizes volunteers in educating the community through events like the annual Bank of Guam IFIT 5k, Strides for the Cure 2k/5k and the Liberation Day Parade. By continuing to support this program Guam takes bigger steps to reduce the volume of the waste. Recycling diverts valuable resources from landfills which in turn makes fewer landfills necessary. Recycling valuable resources can result in cash returns – such as when aluminum is collected at schools and sold so those same schools can reinvest their well-earned funds into academic, athletic and extracurricular programs. Recycling also reduces litter throughout the island and helps our communities to be cleaner and more welcoming for locals and visitors alike. 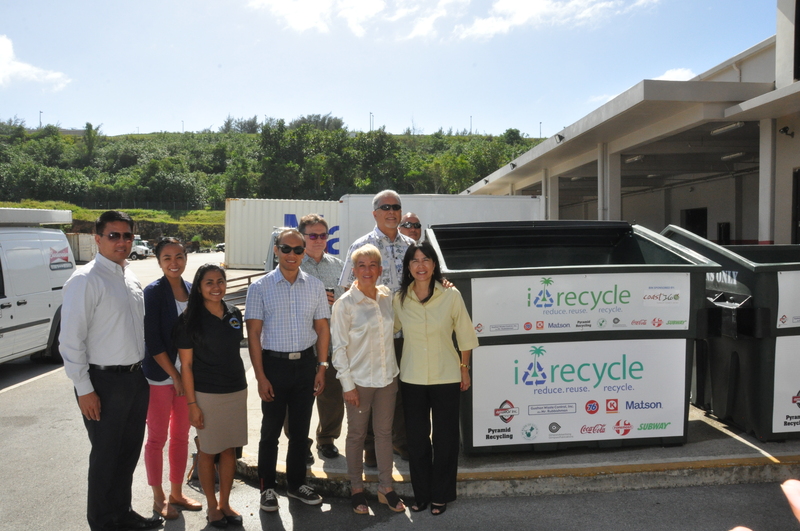 Guam Business Partners for Recycling began the program to educate and promote recycling on an island-wide level. The GBPR’s plan utilizes private, public and DODEA schools as sites for aluminum can recycling bins, affording the entire community convenient access to recycling aluminum cans. 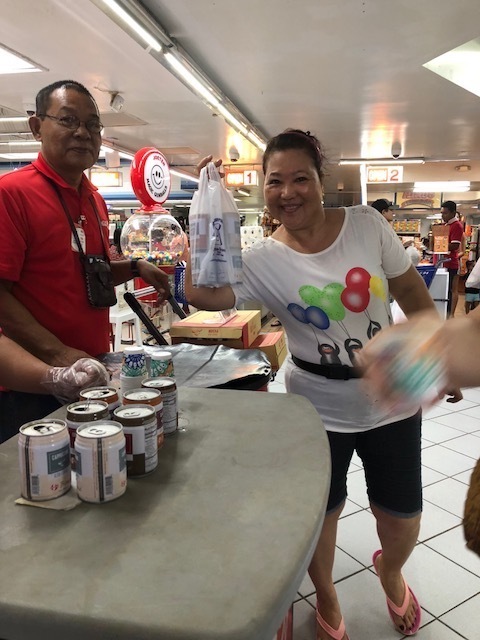 To learn more about the i*recycle program and how you can become involved, contact Peggy Denney, Program Administrator, at (671) 483-9415 or follow us on Facebook at irecycleguam. 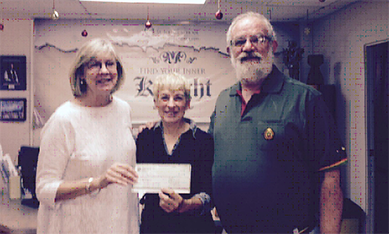 Peggy Denney presented a check for $2,176.00 to McCool Elementary/Middle School representative. 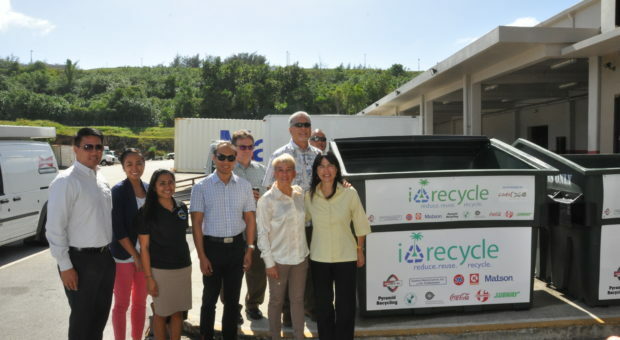 December 2016, Guam – Guam Business Partners for Recycling, Inc. (GBPRI), the non-profit that created the i*recycle program, is in the process of bringing in new plastic 6cy recycling bins to replace the metal 8cy bins that were placed at participating schools in the fall of 2007. “The original metal 8cy bins have helped to grow the i*recycle program to where we are today. 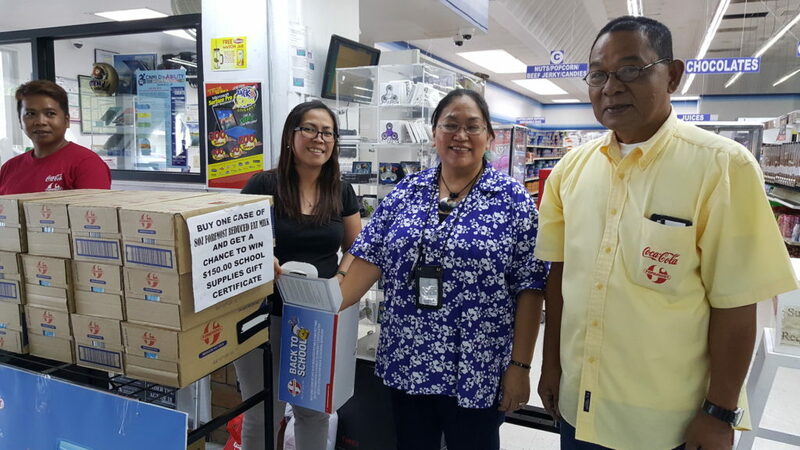 It has served its purpose and we are proud to work with the business community to have them replaced,” said Mark J. Sablan of South Pacific Petroleum and President of the Guam Business Partners for Recycling Board. The new bins cost approximately $1150 apiece, including manufacturing, trucking to the West coast, and signage. Shipping costs are covered by Matson, one of i*recycle’s partners. i*recycle will be soliciting sponsorships from local companies to assist in covering the cost of the bins. Logos of bin sponsors will be reflected in the signage on each bin. The first 12 bins have been received and are ready to be placed at 12 schools. Bins will be delivered over the next two weeks. 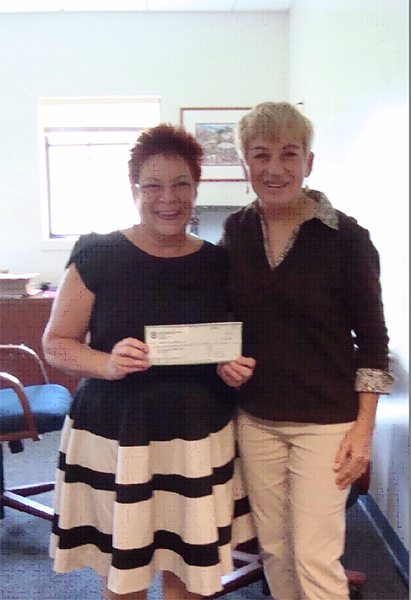 The Pay-Less Community Foundation donated $11,000 to i*recycle from its 2014 Kick the Fat 5K event. The proceeds were set aside to purchase new bins. The foundation’s contribution covers the cost of nine new bins. Eight of these nine bins will be placed at the eight schools that are partnering with the eight Pay-Less Supermarkets to be the recipients of the aluminum cans that are generated at Pay-Less stores. 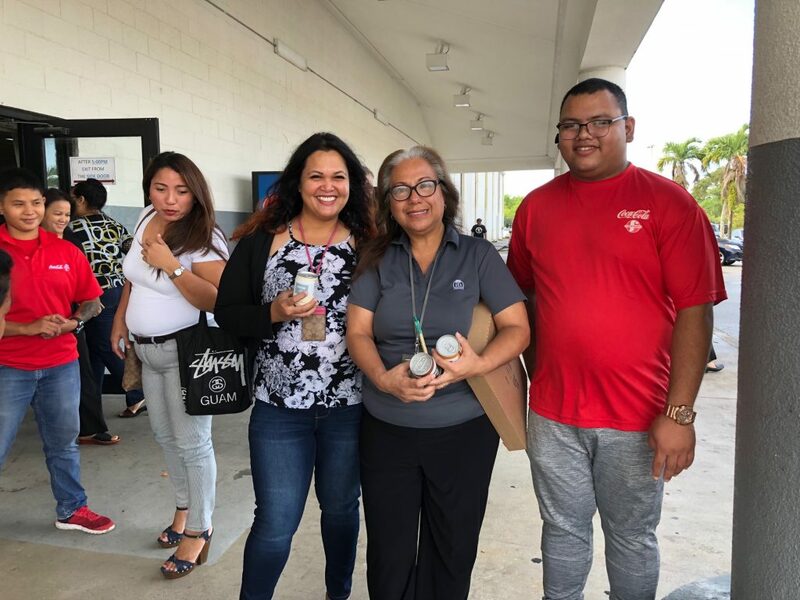 Those eight schools are Agana Heights Elementary, CL Taitano Elementary, Untalan Middle School, Tamuning Elementary, Liguan Elementary, Benavente Middle School, Simon Sanchez High School, and Southern High School. Coast 360 Federal Credit Union is donating $5,500 to i*recycle from its most recent 5K, which will cover the cost of five new bins. The five recipient schools will be MU Lujan Elementary, Wettengel Elementary, Inarajan Middle School, John F. Kennedy High School, and Merizo Elementary. Over the next year, i*recycle plans to bring in a total of 60 bins which will allow 60 schools to participate in the program, thus increasing the number of participating schools by 20. Any company that is interested in sponsoring an i*recycle bin should contact Peggy Denney, program administrator, at 483-9415. The Guam Business Partners for Recycling (GBPR) started the i*recycle program in 2007 by Ambros, Inc., Guahan Waste Control, Inc., South Pacific Petroleum Corporation, Matson Navigation, Pyramid Recycling, Bank of Guam, Glimpses of Guam, Inc., Coca-Cola Beverage Company Guam, Inc., Foremost Foods, Inc., and Subway Restaurants. The program was started to educate and promote recycling on an island-wide level. i*recycle’s plan utilizes private, public and DODEA schools as sites for aluminum can recycling bins, affording the entire community convenient access to recycling aluminum cans. Since the programs start in 2007, i*recycle has collected and recycled over 11 million aluminum cans.